Stainless steel is regarded by many as a wonder material. It's stronger and more durable than many other construction-type metals, and it's highly resistant to corrosion and, of course, stains. It's also spiffy enough for use as a finish material with no additional embellishments or treatments. Stainless steel can be cut, even by amateurs. Stainless steel comes in many forms, from sheets and tubing to solid rods and bars. Around the house, the most common form is the sheet steel used for countertops, backsplashes and appliance facings. 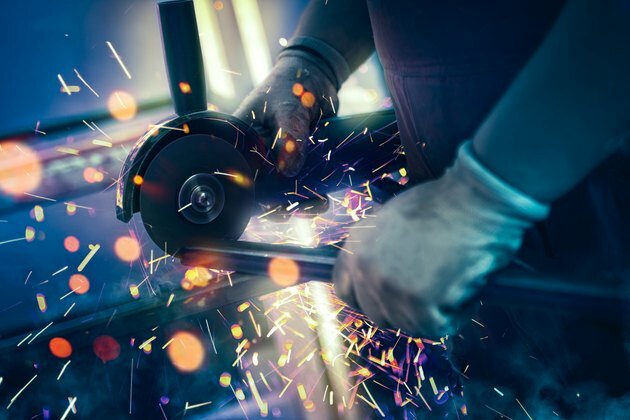 While bars and other thick, solid forms of stainless are often cut with a plasma cutter, homeowners can cut stainless sheets and other relatively thin materials with several different types of power tools, including shears, saws and grinders or rotary tools. Stainless steel is an iron alloy, or mixture of metals, typically containing carbon, manganese, silicon, nickel, molybdenum and chromium. The chromium component is crucial, as it forms the "passive layer" that gives the alloy its corrosion-resistance. All stainless steel contains at least 10.5 percent chromium. When cutting stainless steel, the important thing to remember is that it is a ferrous metal, meaning it contains iron. Ferrous metals tend to be harder—and harder to cut—than nonferrous metals such as aluminum and copper. When purchasing blades or discs for cutting or grinding stainless steel, be sure they are specified for ferrous metals and specifically for stainless steel, as applicable. The best tool for cutting stainless steel will vary depending on the material you're cutting. For thin sheet materials up to about 18-gauge in thickness (the lower the gauge the thicker the metal), the best ordinary shop tool is electric shears. These have strong jaws that nibble through the metal, cutting out a 1/4-inch-wide strip and leaving a very clean edge. They can also cut curves. What shears don't do well is make interior cuts, such as for a sink cutout, because they have to start at an edge. The solution is to cut a hole (usually with a hole saw) that's large enough to allow the shears to get a good bite into the material. 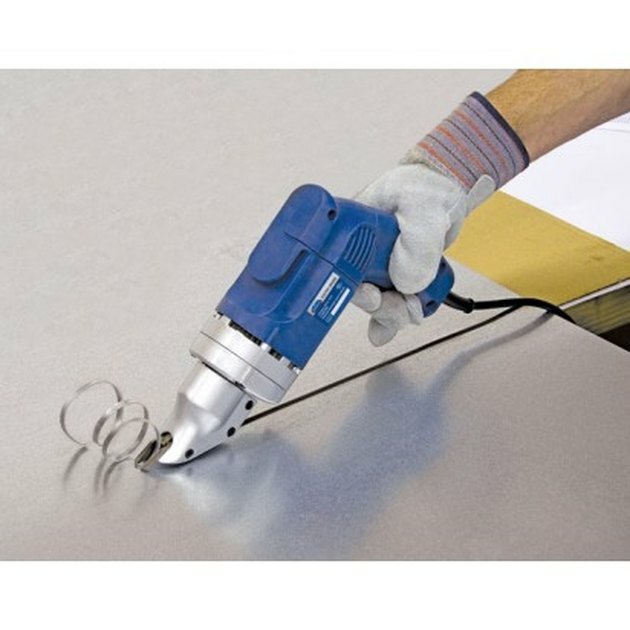 Electric metal-cutting shears are the best for cutting stainless steel sheets. The next-best tool for long cuts on sheet steel is a circular saw with an abrasive blade made for stainless steel. This creates a lot of sparks, but it makes a fairly clean cut, especially when using a straightedge to guide the saw. A circular saw won't cut curves, so you'll have to switch to a jigsaw or a grinder for curved corners. A jigsaw with a carbide blade for stainless steel can cut steel sheets up to about 5/64 inch thick. Jigsaws can make long straight cuts (best with a straightedge guide), but are most handy for tight curves and interior cutouts. 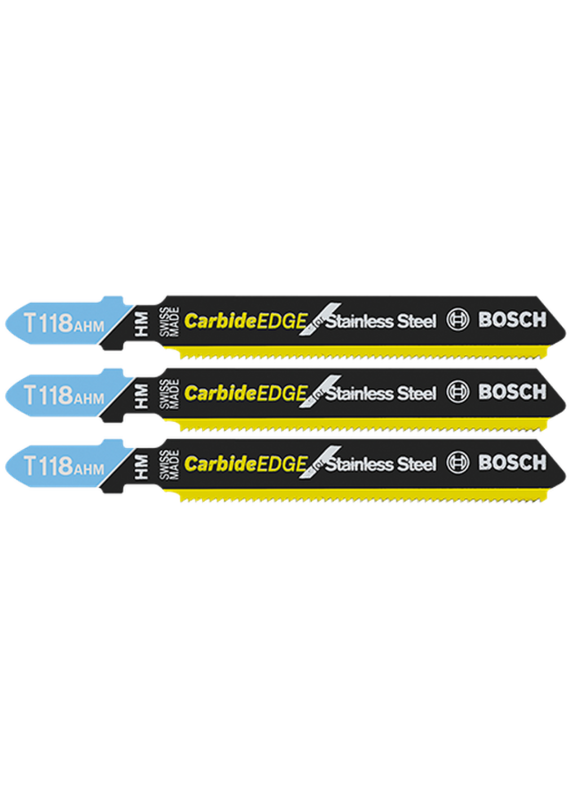 Choose jigsaw blades designed for stainless steel. Small cuts in sheet steel or somewhat thicker material, such as stainless steel tiles, may be easiest to make with a grinder or a rotary tool. 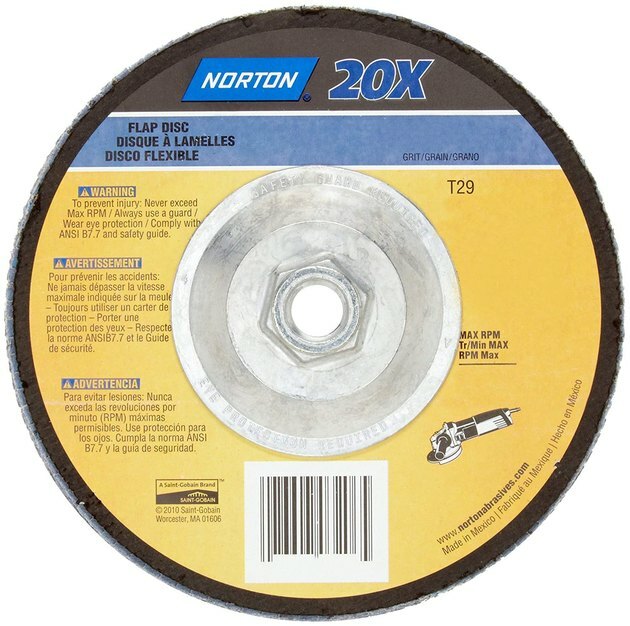 Use an abrasive cutting wheel made for stainless steel. 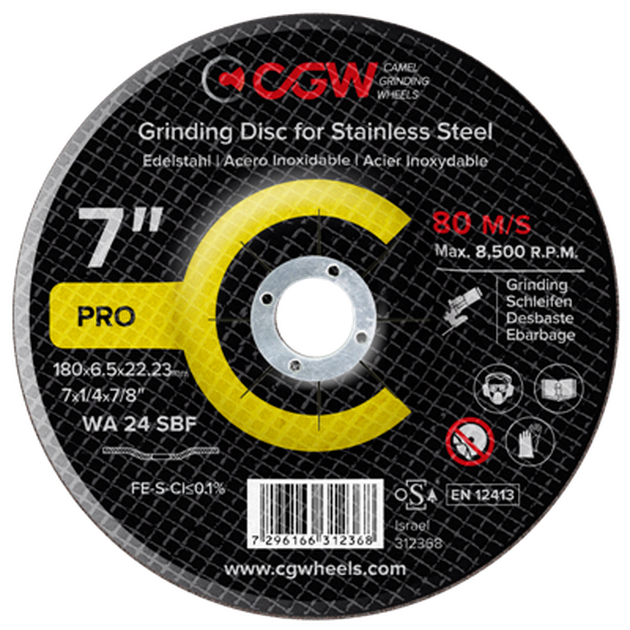 Conventional abrasive wheels can more easily overheat stainless steel and won't cut it as efficiently. As is true of all metals, cutting stainless steel can actually alter the atomic composition of the metal, resulting in changes to its appearance and performance. Welders have to be particularly careful when working with stainless to prevent overheating and problems related to contaminants. You can also overheat stainless steel when cutting or grinding it with handheld power tools. In many cases, the worst damage you'll do is cause some staining or bluing of the metal, which often can be grinded or polished away. However, discoloration can be a sign that the metal is no longer corrosion-resistant, due to metallurgical changes caused by excessive heat. The bottom line is that you should prevent overheating by using blades or discs designed for stainless steel. These may be thinner or otherwise optimized for reducing heat during cuts. Also, try to keep the tool moving and not to overwork the metal. For thinner sheet metal, shears eliminate the risk of overheating because they slice the metal and create very little heat. Grinding disc for stainless steel. Techniques for cutting stainless steel with a circular saw and a jigsaw are similar. If the cut is an interior cutout, a circular saw can simply initiate the process with a plunge cut; a jigsaw requires a starter hole, which can be drilled with a drill bit or hole saw designed for metal. Place the sheet facedown on your work surface. Mark the cutting line with a marker on the backside of the sheet. Clamp a straightedge guide (a level, a board, or a straightedge) over the stainless sheet, positioned so the saw blade will be on the cutting line when it's up against the straightedge. Make the cut with steady but modest pressure on the saw, letting the blade do the work. Do not force the saw, which can dull the blade and overheat the metal. Keep the base of the saw against the straightedge throughout the cut. Clean up the cut edge with a grinder and flap wheel (designed for stainless steel) to remove burrs along the cut edge, if desired. You can also use a metal file or 80-grit sandpaper and a sanding block. A grinder can cut a variety of stainless steel materials, including sheets, tiles and thicker stock. It does create a rough edge, particularly on sheet steel, but this is easy to grind off with a flap wheel made for stainless steel. A rotary tool, such as a Dremel, can also make small cuts in stainless steel, using similar techniques. Mark the cutting line on the top side or face of the material, using a marker. Apply a line of blue painter's tape on the good side (not the waste side) of the cutting line so the edge of the tape follows the line. This step is optional but is recommended to help you follow the line during the cut. Clamp or otherwise secure the material, as needed. Make the cut so the grinder wheel cuts down into the steel from the face side; this ensures the burrs from cutting will be on the backside of the material. Switch out the grinder cutting wheel for a flap wheel, and remove the burrs along the cut edges on the backside of the material.